"Clipboard control" dialog box is called from "Smart Control" panel. 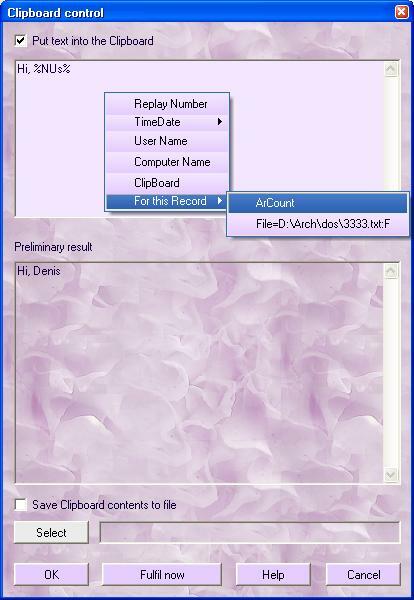 You can get access to the dialog box both during the Record (by pressing Shift twice) and while editing a ready task by inserting Smart Control. If you check the box , you'll be able to copy any complicated text into the Clipboard. It can be a simple text, or it can contain dynamic variables, like date, time, user name, etc. These variables are inserted through the context menu, which is called by a right mouse button click. For example, at the moment when the event is Replayed (the event, which corresponds to Smart Control and contains a certain text, you can see it in the picture), the time and date, corresponding to the moment of Replay, will be placed into the Clipboard. - if you check this box, you will be able to choose a file, where you want to save the Clipboard contents (at the moment of the Smart Control Replay). - allows to put the necessary text into the Clipboard right away or to put the Clipboard contents into a file, if you check the necessary boxes. How to insert a certain text.